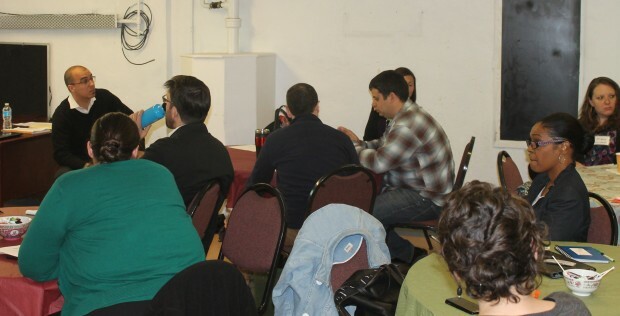 At left, Matt Davis, director of the archdiocesan Office for Pastoral Care of Migrants and Refugees, leads a discussion on making parishes more welcoming and accepting of ethnic diversity during the Global Solidarity and Local Action Workshop held April 30 at St. Thomas Aquinas Parish, South Philadelphia. South Philadelphia’s St. Thomas Aquinas Parish is one of those wonderfully blended parishes that truly represent the universality of the church. Despite its designation as a territorial parish many members of the congregation come from well outside of its designated territory. That’s because at St. Thomas weekend Masses are celebrated in English, Spanish, Vietnamese and Indonesian. What better place for the Global Solidarity and Local Action Workshop that was held at the parish’s Aquinas Center on April 30? The workshop covered both global and local issues, and the presenter for the first part was Cheryl Mrazik, relationship manager/advocacy for Catholic Relief Services in Radnor. Mrazik spoke of the many reasons people from other lands wish to come to the U.S. and Europe – lack of freedom in their home country, war, drought, family and the chance to earn a decent living. In Syria, which has been ravaged by civil war, there have been 150,000 deaths, Mrazik said. There are about 2.5 million refugees, including 1 million children. CRS tries to help especially with the children, many of whom show signs of post-traumatic stress disorder (PTSD) because of their terrible experiences. In Mexico, on the other hand, migration is driven by economics. Many small farmers can’t compete with newly introduced mega-farms. CRS tries to help by encouraging the farmers to form cooperatives that make them more competitive or through skills training that teaches them more efficient farming methods. But the main reason for migration to the U.S. is to earn a better wage. They come because there are more jobs available, especially unskilled jobs that no one else wants. “If they can’t find legal ways to come they will find illegal ways,” Mrazik said. Migrants can earn much more here than at home even though the wages they receive generally are low by American standards. The remittances they send back home help their families to survive, she noted. 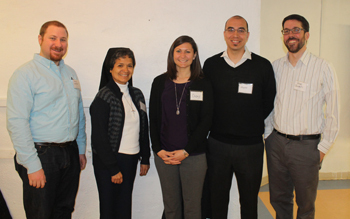 Attending the workshop at St. Thomas Aquinas Parish April 30 were, from left: Peter Pedemonti of New Sanctuary Movement; Sister Ruth Bolante, I.H.M., Diocese of Metuchen; Cheryl Mrazik of Catholic Relief Services; Matt Davis, archdiocesan Office for Pastoral Care for Migrants and Refugees; and Daniel Colbert, Liberty Church. On the advocacy end, Mrazik urges Catholics to prod the government to accept more migrants, especially refugees. The bulk of the workshop had to do with welcoming immigrants, migrants and refugees into the parishes of the Archdiocese of Philadelphia. There are more of them here and elsewhere than one might realize. At this time 42 percent of the Catholics in the U.S. are Latinos and there are other Catholics who are Asian or African, according to Matt Davis, director of the archdiocesan Office for Pastoral Care of Migrants and Refugees. If it were not for the huge number of Catholic immigrants the church in America would be shrinking. Davis points to statistics that show in the near future, the majority of American Catholics will be Hispanic or of Hispanic descent. Simply welcoming newcomers into the parish isn’t enough, it has to be a homecoming, he observed. The Aquinas Center, located in the former parish convent under the direction of Bethany Welch, deals with the social issues of the very multicultural parish every day.